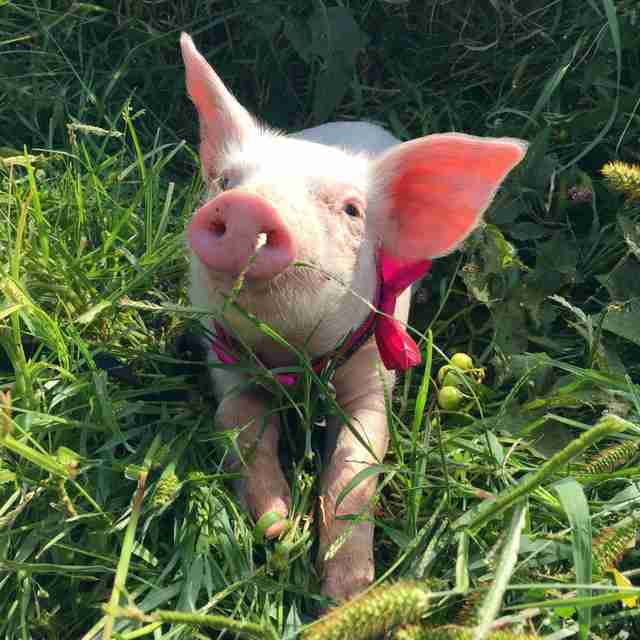 Driving down an interstate near Ames, Iowa, over the summer, a passerby spotted someone completely unexpected lying on the shoulder of the busy highway: a tiny, pink piglet. 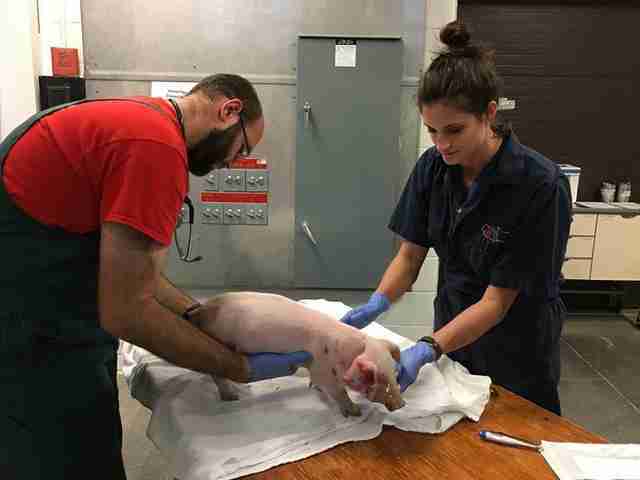 With her small face and body patched with road rash from scraping against the pavement, the piglet, later named Fern by rescuers, was rushed to the Iowa State University Large Animal Hospital where she stayed overnight for a health assessment and pain medication. After confirming Fern had not broken any bones, she was then transferred to Ames Animal Shelter, who connected with Iowa Farm Sanctuary to give her a forever home. 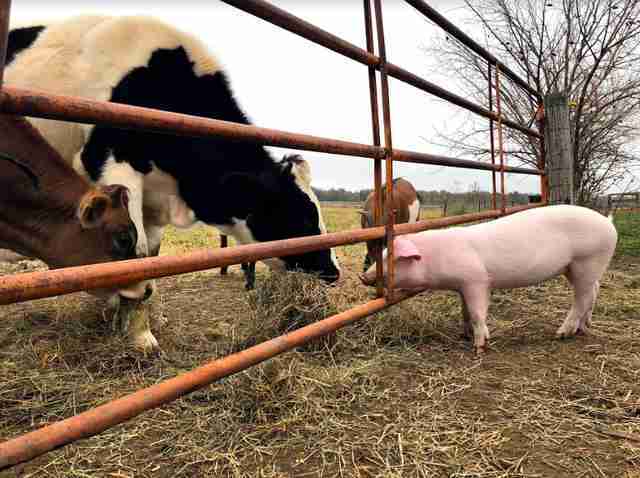 Judging by the nature of Fern’s injuries and a serial number tattoo behind her right ear, the vets and sanctuary officials believe Fern had jumped out of a pig transport truck that was on its way to a commercial breeding facility. 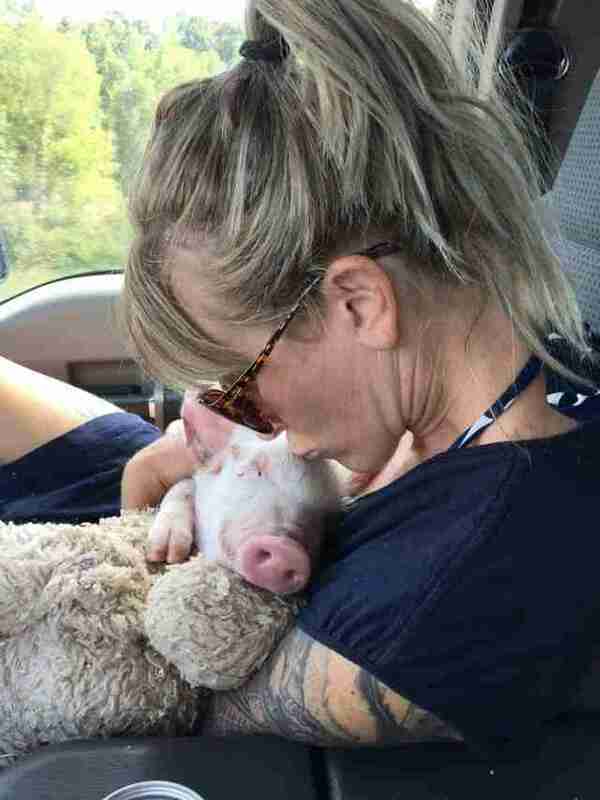 In a video of Fern’s trip to her new home after leaving the animal shelter, sanctuary cofounder Shawn Camp cuddles the small piglet in her arms. As they approach a transport truck driving in the other lane, Fern instantly begins fearfully squirming and squealing as if she was experiencing pain. Now fully recovered from the road rash and trauma from that day, Fern has settled in comfortably to her new home. Since she’s only a few months old — and far too small to live full-time alongside the sanctuary’s other resident pigs — Fern has what Wilde calls her own “pig apartment” inside the home on the property. While she enjoys time inside the warm house, Fern’s favorite activities include snacking on tomatoes and watermelon and playing with the other resident animals — regardless of how small she may be in comparison. In Fern’s short time at her new home so far, the brave little pig has left a lasting impact on the sanctuary — so much that Wilde just got a matching tattoo behind her own ear in tribute to the former life Fern will never have to experience. For more information about Iowa Farm Sanctuary, visit its website here. To support the continued care of Fern and other rescued animals at the sanctuary, you can make a donation.